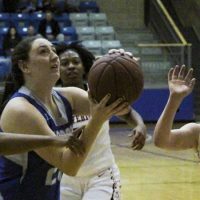 The McCook Community College Lady Indian basketball team downed Northern New Mexico JV Saturday in the opening game of the Lamar Community College Classic, 94-46. Freshman Makenna Bodette (Colorado Springs) scored 19 points to lead MCC. Sophomore Anna Sanjuan, (Reus, Spain) scored 18 points. “We played so hard as a team today it was fun to see that effort,” Fernetti said. MCC improves to 8-3 and plays Lamar Community College at 2 p.m. (MT) Sunday. The Lady Indians wrap up the pre-holiday portion of the schedule Dec. 7-8 in the Peter and Dolores Graff Events Center. MCC hosts Eastern Wyoming Friday at 5:30 p.m. and Laramie County Community College Saturday at 2 p.m.